(If an error message displays, please refresh the page to reload). 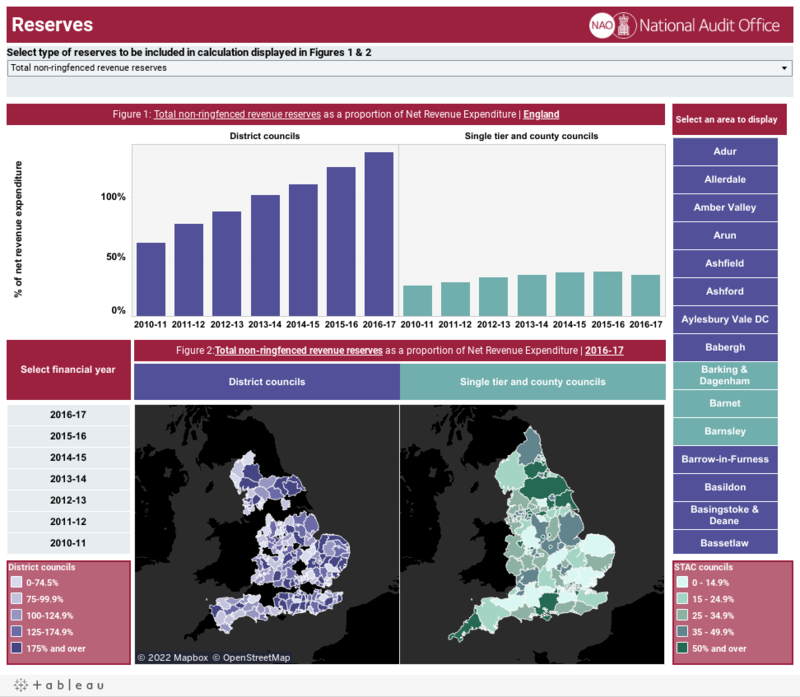 The interactive visualisations below describe changes in local authorities’ financial circumstances from 2010-11 to 2016-17. You can use them to explore broad trends identified in our report Financial sustainability of local authorities 2018 in order to gain a more detailed understanding of the experiences of individual local authorities. The data we present shows changes in income and spending alongside analysis of factors such as budget overspends and use of reserves. These figures can change for a range of reasons such as local political priorities, changes in local demand and changes in government policy and priorities. Consequently, comparisons between places need to be undertaken with caution. The complexity of factors underlying the data means that differences in figures presented here should not be viewed as indicative in any way of the current ‘performance’ of an authority. Any apparent differences between places should be seen as an opportunity to gather more information and build a richer understanding. The data in the report was used to present a picture of the key trends affecting the sector or particular groups of authorities. The analysis was not designed to identify specific authorities that were felt to be at risk. While we present data for individual authorities in the visualisation, the purpose is to allow for comparison between individual authorities and comparator groups on individual indicators. While the data in these visualisations is potentially relevant to an assessment of the financial sustainability of individual authorities it by no means represents a full assessment. As such these visualisations should not be used to draw conclusions on the overall financial sustainability of particular authorities. The data in this visualisation is the same as for our report Financial sustainability of local authorities 2018. A full methodology is available. This provides a full account of the data sources, definitions and adjustments that have been used in both in the report and the visualisation. An additional set of methodology notes is available below which provides information on key aspects of the visualisations. An FAQ section is also available below. All the data shown in these visualisations has been taken from data published by the Ministry for Housing, Communities and Local Government (the Department), much of which was derived from returns from local authorities. We have made a small number of adjustments to reflect changes in reporting and responsibilities in certain service areas over this period (full methodology). However, we have not sought to quality assure every data point provided by each individual local authority. Watch the video to help you navigate your way through the visualisations. Hovering over the maps and charts gives you more detailed information. If you click on an area on the map, or click the name of an area on the list, the data presented will be for that area only (or that area will be highlighted in the charts). Government funding to local authorities has fallen substantially since 2010-11 to help meet the government’s objective to reduce the deficit. The Ministry of Housing, Communities & Local Government measures the impact of reducing government funding on local authority income via ‘revenue spending power’. This indicator captures the main streams of government funding to local authorities alongside council tax. We found that nationally revenue spending power fell by 28.6% in real terms from 2010-11 to 2017-18. If council tax is removed, our analysis shows that government funding fell in real terms by 49.1% from 2010-11 to 2017-18. Figure 1 presents the trends for ‘Government Funding’, ‘Council Tax’, and ‘Spending Power’ for all local authorities in England. Figures 2 and 3 will display the measure selected in the top left corner (by default it displays revenue spending power). Selecting an individual local authority on the map or authority list will display that local authority’s data in Figure 1 and highlight the selected local authority’s data in Figure 2 (use the control above the map to switch between single-tier and counties, district councils or all local authorities). This dashboard presents change in revenue service spending by service area between 2010-11 and 2016-17. Nationally adult social care and children’s social care have been relatively protected. Some other service areas have seen substantial reductions in spending. 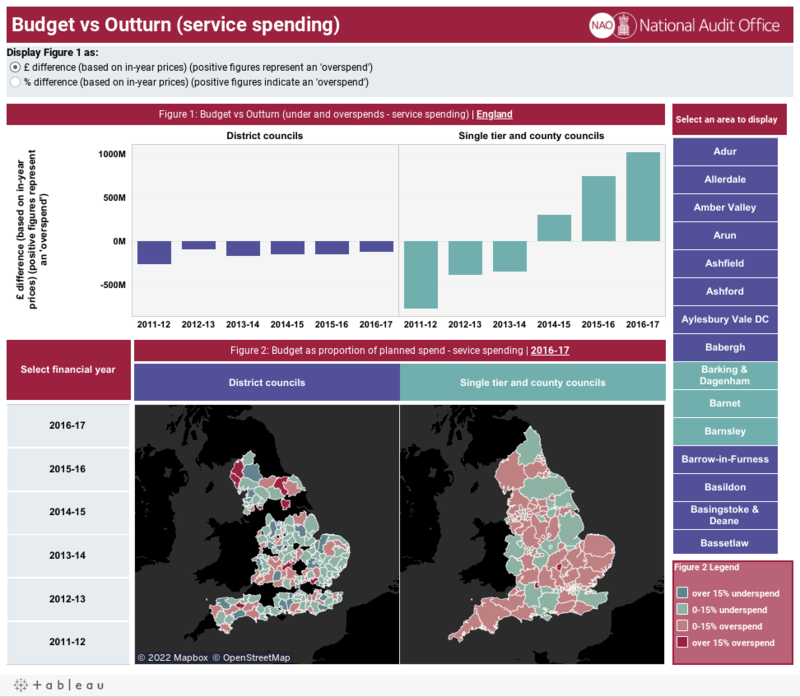 The dashboard shows service spend data for England and individual local authorities (selected from the list). Figure 1 shows the change between 2010-11 and 2016-17, Figures 2 and 3 show the full time series for each service, in real terms and percentage change since 2010-11 respectively. Hovering over a service in Figure 1 will filter Figures 2 and 3 to only show the selected services. Hovering over a service in Figure 1 will show the 2010-11 and 2016-17 net expenditure data for the sub-services that comprise the selected service. This drill down is not available for adult social care or children’s social care due to changes in sub-service definitions over the period. 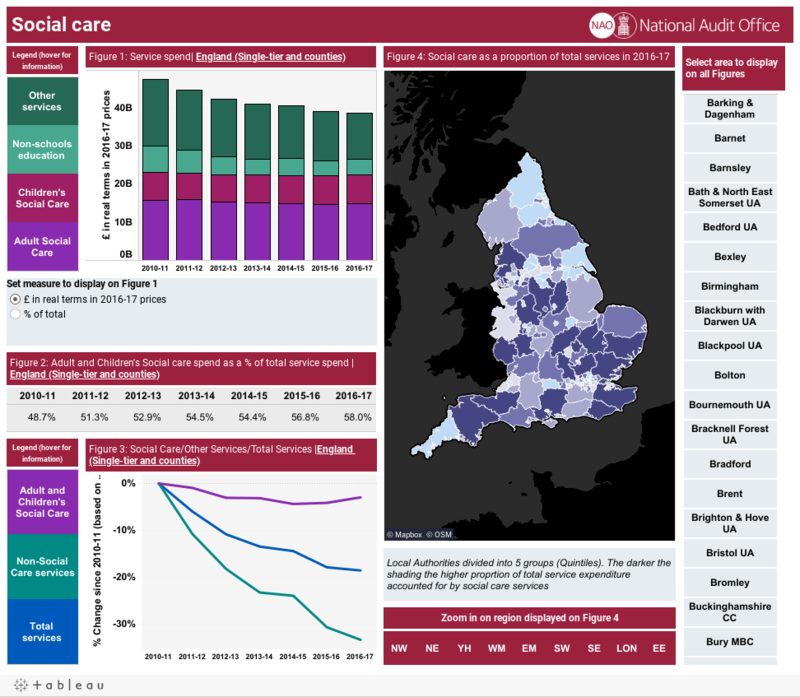 Dashboard 3 shows the change in social care services (adult and children’s) compared to other services over time for England. It shows that social care has grown as a share of service spending from 2010-11 to 2016-17. This analysis is only for single-tier and county councils. Individual authorities can be selected from the list. Figure 1 shows the amount of remaining reserves as a proportion of net revenue expenditure spent in a year. It shows data for district councils and single-tier and county councils. It will display data for an individual local authority when selected from the map or sidebar. Figure 2 shows the amount of remaining reserves in 2016-17 as a proportion of net revenue expenditure. The drop-down selection control above Figure 1 can be used to select whether earmarked, unallocated, or both earmarked and unallocated reserves are used in the calculation shown in Figures 1 and 2. In the early years of funding reductions, local authorities in general were able to deliver underspends on their service budgets. However, from 2014-15 to 2016-17 the sector as a whole has consistently overspent these budgets. Overspends on service budgets need to be addressed by the use of reserves, making more savings elsewhere or generating extra income. The data in this visualisation is the same as for our report Financial sustainability of local authorities 2018. A full methodology is available here. This provides a full account of the data sources, definitions and adjustments that have been used in both in the report and the visualisation. The following sections also provide some of the key methodological points. Types of local authority: This visualisation presents data for five types of local authorities – London boroughs (including City of London), metropolitan districts, unitary authorities, county councils and district councils. Owing to the similarities between unitary authorities, metropolitan districts, London boroughs and county councils we frequently focus on them as a distinct group of authorities called ‘single-tier and county councils’. In some service areas, such as adult and children’s social care, it is only these authorities that have statutory responsibilities. Deflation series: Where data is converted into real terms we have used the HM Treasury deflator series published on 28 November 2017 to convert all values to 2016-17 prices. Definition of government funded spending power in Figure 1: Government funded spending power is defined as the grants and funding streams listed by the Department in any given year as components of spending power, with the exception of council tax, Public Health grant, and transfers from health bodies. This definition includes an assumed amount for 50% retained business rates. Estimates of change in spending power: Due to regular changes to local authority duties and reporting arrangements since 2010-11 like-for-like comparisons over time are only possible if the data is adjusted to account for these changes. Each year the Department publishes an adjusted version of the year’s data that is comparable to the previous year, enabling comparison between pairs of years. We use this to create a chain-linked index for the years 2010-11 to 2017-18, in which pairs of adjusted years are linked by a weighting process. We exclude Public Health Grant, the original Better Care Fund and other NHS health transfers from our analysis of spending power. For full details please see the standalone methodology that accompanied the report. Data is taken from the revenue outturn (RO) suite of data returns published annually by MHCLG. Data is shown for change in net spend rather than total spend. Net current expenditure is funded by an authority’s own resources, such as business rates, grants and council tax. Total spending includes net spending but also includes spending supported by income generated within the service area and reserved for use within the service. This includes income from sales, fees and charges or transfers from other public bodies. Net spend can fall due to both reductions in total spend and increases in income. In some instances an authority may register negative net expenditure in a particular service area, which means that its income has outstripped its net spend in that year. 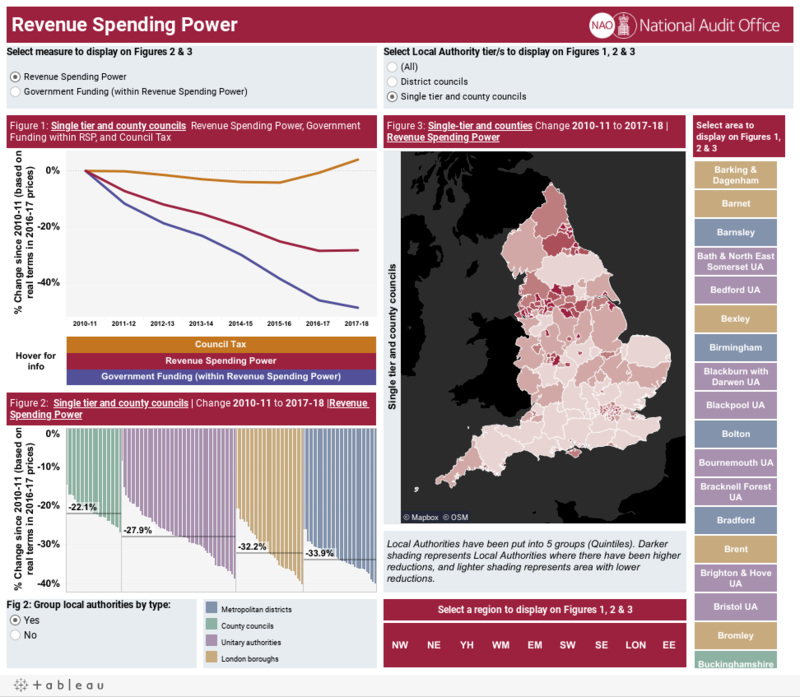 In our analysis of change in spend over time by service area, where an authority has experienced an increase in negative net expenditure (ie its income outstrips total expenditure more in the second period than the first) this will show as a decrease in net spending in the visualisation. Adult Social Care data at the England level has been adjusted to include funding from the Better Care Fund used to support local authority services, and other transfers from the NHS to local authorities. This adjustment is in line with the national data in the report. However, we have not made the same adjustment to the local authority level data in the data visualisation as the data needed for the adjustment is not available at the level of individual authorities. Children’s Social Care data has been adjusted. In 2014-15 a number of sub-service spending lines were moved in the data returns from education services to children’s services. In order to ensure consistency over time we remove these two sub-services – Sure Start and services for young people – from our children’s services figures. Non-schools education spending includes spend recorded under the education services line in the Department’s RO data returns, however we have stripped out spending by schools and spending passed through local authorities to support adult education. We add spending on Sure Start and services for young people into this line from 2014-15 onwards to enable a like for like comparison over time. For full details please see the standalone methodology that accompanied the report. Data for change at the sub-service level is taken from the RO returns. In some cases where we have used RO sub-service data we have grouped some of the sub-services into slightly larger service areas for presentational purposes. For information on which RO sub-services are included in each of the sub-services we present and our approach to addressing any definitional changes over time please contact the National Audit Office directly. We have excluded a small number of sub-services from the figure for presentational reasons. These are low spending areas that have experienced substantial changes in percentage terms. Different types of local authority have different responsibilities and care should be taken in comparing service spend between different types of authority. Analysis of reserves relates to useable non-ringfenced revenue reserves (earmarked and unallocated). Unusable, capital, schools and public health reserves are not included. In some cases our analysis focuses on total reserves – the sum of earmarked and unallocated reserves. Earmarked and unallocated reserves are held separately by local authorities. Earmarked reserves are held for a specific purpose or projects. However, local authorities are able to re-assign earmarked reserves for general use if required either during budget setting or in-year. Trends in levels of reserves are taken from the Department’s RO return. This shows earmarked and unallocated reserves as a share of net revenue in each year in single-tier and county councils, and district councils. This figure shows change in ‘total reserves’, which is the sum of earmarked and unallocated reserves. Data for schools and public health has been removed. Dashboard 5 includes analysis of variance between the initial budget at the start of the year and outturn spend recorded at year end. Budgets can be revised in year. This is not reflected in our analysis. Dashboards 2 and 3: Service expenditure data from 2010-11 to 2016-17 uses data published in the Department’s revenue outturn (RO) returns and revenue outturn special and specific grants (RG). Dashboard 4: Net revenue expenditure and reserves data from 2010-11 to 2016-17 published in the Department’s RO returns. 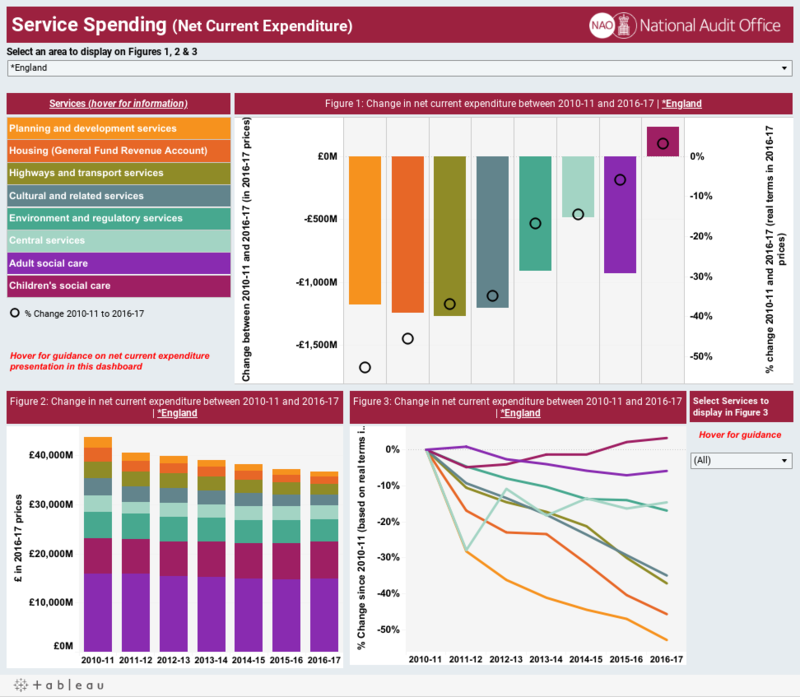 Dashboard 5: Outturn expenditure data published in the Department’s RO returns. Budgeted expenditure published in the Department’s revenue account budget (RA) returns. Why has the NAO published this data? The visualisation is published under the Local Audit and Accountability Act 2014. This provides powers to the Comptroller and Auditor General to examine the economy, efficiency and effectiveness with which local authorities use their resources in discharging their functions. The purpose is to provide evaluation, commentary and advice of a general nature. The figures presented here should not be viewed as indicative in any way of the current ‘performance’ of any individual local authority. A complex range of specific factors underlie the results for each local authority and you should not assume that one authority can be compared directly with others. Phone the NAO Enquiries point +44 (0)20 7798 7264 .